Blessed Being, you are at a beautiful culmination point. As we see you, this is always true; for from this perspective of Love you are cherished beyond measure as you are Life’s potential in form. The sweetness of your mechanism is understood and appreciated. Your ability to choose, to avoid, to confront—all treasured. Dear One, you are the magnificence of form forming, life progressing, and you are enveloped in Love at all times. You are presently the gift of Life, breathing it in and exhaling it forth. You have great power. Is it not odd that we would arrange Foretelling before Hindsight? For it seems that the Hindsight is the past that has already formed and it must be used to Foretell the future. Yet we call you to the new, to blaze a new trail of Life, to become the new solution to the progress of humanity. You are deep within the throes of your Ascension. More and more are awakening. They are feeling and connecting in ways unheralded. Yet others still sleep. All perfect, as those sleeping stir greater desire for movement within you. Become that movement now, in this moment now, and Foretell a new future into form. Hindsight is valuable. It serves great purpose in helping you to choose—as you wisely weigh options. It also has the potential effect of slowing movement as one becomes careful based on perceived mistakes or trauma of the past. At times, even this is valuable as you slow to strengthen more. Yet you are at a beautiful culmination point, Lightworker; a time of great movement and creation. Your ability to focus the future into form is enhanced, both because of you and because of the flow of Life. Allow the foundation of your wisdom to support you, even as it expands. Embrace your innate wisdom. You will find it in the stillness of the depth of your heart. Your mind, your Hindsight, follows. To Foretell the future is to allow your present moment to become drenched in the potential you desire. A peace, a Love, a fulfillment so saturating that you feel it prior to form. Immerse yourself in Life and let it ebb and flow with a wisdom that Knows you are Creating. To focus on creating the future and allowing Hindsight to support your strength is equivalent to becoming the cause that creates the effect. As you focus more on effect rather than cause, you are profoundly, subtly appreciating the past, integrating the wisdom of it and allowing its highest potential to manifest through you. You are the cause – now effect. Flow your Love into Life and effect it! The past already has been. Rather than resist it, cause it to create a new solution. Allow it to become the platform of the wisdom of lesson learned that supports new choice. Every experience of the past offers the potential of greater wisdom. Blessed Being, you are the beautiful culmination point. What effect will you cause with your profound power of Love? As we sit to Blast Foretelling and Hindsight, we are embracing our humanity and anchoring the wisdom of the past for the brilliance of the future. We are focusing our powerful intent toward the elevation of humanity’s grace. We are honoring our separation and enhancing our connection as we see the future of Love’s evolution forming. We are powerful beyond measure, finding the courage to allow our vulnerabilities to expand our strength. We are the peace that encompasses all understanding. Blast on! Kryon~ Lee Caroll my first card I pulled from his deck read as follows ” There are no greater entities on Earth than the Humans in Lesson! Believe it! All the others are here to service your work.. 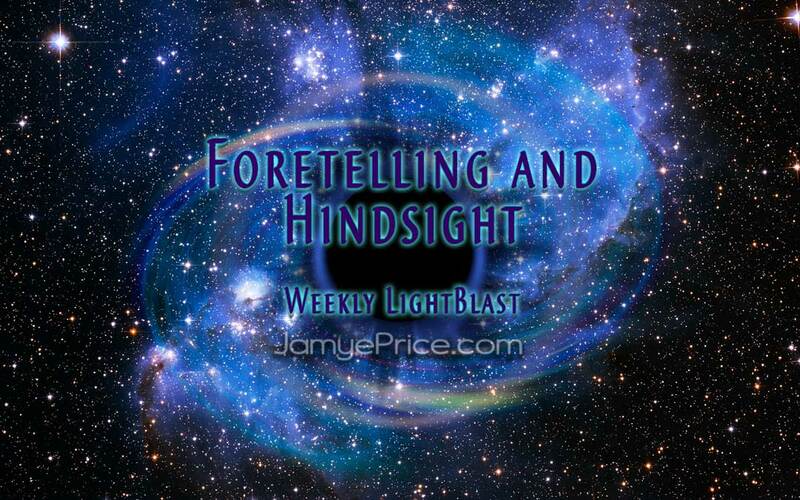 Profound as this so resonates in my life gosh… The weekly light blast this week Foretelling and Hindsight is synchronistic for me giving by two great master teachers.. I’ am looking for a good tool belt Violet.. God bless I’ am grateful to be here.. Wonderful, Gina! I love Kryon!